We started Thursday off with a lecture from the director of CEM Ana Sanchez, a prominent female figure who exemplifies what it means to be Cuban. Her topic was on Cuban education and its improvements since The Revolution. Under President Batista illiteracy rates were at 25%. When Fidel took power he vowed to eradicate illiteracy and was able to accomplish his goal by 1961. Cuba has limited natural resources and is incapable of receiving aid from the United States because of the strict embargo. Fidel recognized this struggle and declared human capital his most important resource. “If you know, teach. If you don’t, learn” was the slogan during the campaign against illiteracy. The Cuban people never questioned this mentality. With United States presidents continuously bullying the nation of Cuba in an attempt to force them out of socialism, it only brought the people stronger. When asked how they have survived such hard times, Ana simply responded “We are Cuban”. She was proud of everything she has had to endure and says it only has made her stronger. When the socialist block fell in 1991, Cuba lost all of its allies. Fidel called for a meeting with the people of Cuba. He explained what this meant to them and how it may potentially force them out of socialism. Cuba received its oil and machinery from the USSR, food from Czechoslovakia, and clothes from Poland. Ana was in the crowd that day when the people of Cuba told Fidel they did not care how hard it was going to be on them, they were not going to be bullied out of socialism. Fidel admitted to the people supplies will be scarce, food won’t be guaranteed and life will brutal at times, but as Ana said “We are Cuban”. From 1991-2005 Cuba endured some of its worst nightmares. In what is now known as the special period, Ana explained her everyday life. She had to walk 25 km everyday too and from work because of the shortage of gasoline. She needed to walk up 368 steps every night to get to her apartment because they could not afford to maintain the elevator. She ate rice and beans essentially every meal for 10 years. When teaching, she made her students reuse paper because it was such a scarcity, and every exam needed to be given orally. But she prevailed. Ana knows she could go to any nation and receive a healthy salary. With a PhD and her years of experience, she is very valuable. She explains, however, that so many people like her stay because of the morals the Cuban people preach everyday. Lessons from Jose Marti have been passed down generation to generation and Cuba is like no other nation in the world. 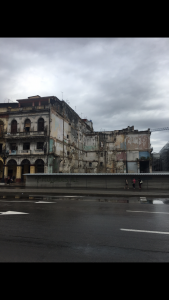 Though the majority of Cuban people feel the same way as Ana Sanchez, many Cubans have left in the past in hopes to seek more financial security and a better life for their families. On April 20th, 1980, Fidel Castro opened the port of Mariel for the Cuban people to freely emigrate to the United States. It is estimated 125,000 Cubans fled to Florida during the time of the Mariel Boat lift. Though this was a significant emigration from Cuba, it was only 1.3% of their population of 9.835 million in 1980. So why did the other 98.7% of Cubans decide to stay if times were so tough? Above all, the Cuban people pride themselves on strength through culture. Yes, they may have shortages of food and resources, but they make up for it in pride. They look out for one another like brothers and sisters would, and unite together to stand up to bullies across the world. After class we headed to the bus for a group lunch. Greeted by our bus driver Elio’s large smile everyone was in good spirits. Not far from the CEM on a major road, I felt our bus starting to drift left. The roads of Cuba are not ones I would like to drive on and Elio needed to swerve around people all the time to avoid accidents. But this was different. Our bus continued to swerve and aggressively drove up onto the median. Elio instantly went flying laterally across the bus and hit his head extremely hard on the floor. Julian and Ilene escorted everyone off of the bus and brought us to the side walk to wait. Within seconds, random pedestrians were pulling over to help us. From directing traffic to helping Elio recover after fainting, I had never seen anything like this in my life. Two minutes passed and Elio was already in a taxi on his way to the hospital with another pedestrian. 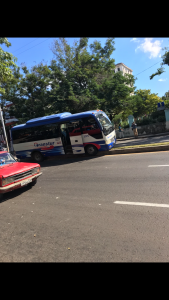 Ilene called Helene, the API director that lives in Cuba to notify her of what happened, and she was on site with a new bus within five minutes. Police responded to the accident in what seemed like record time, and we were on our way to the restaurant 10 minutes after the accident happened. I have never seen such unity in my life. The people of Havana treat the entire city like their home, and if something happens in their home they need to make sure it is resolved. Luckily, Elio was ok and made a full recovery after fainting. I knew Elio would be ok, though, because as Ana says “we are Cuban”. At night we went to a Cuban Baseball League playoff game. The Havana Industriales were playing the Las Tunas in the third of a best of seven game series. We sat directly behind home plate in seats that would have cost hundreds at Fenway. We were warned to get there three hours before the game because it was going to be a spectacle like nothing we have ever seen. There was a retirement ceremony in Carlos Tabares honor after playing for the Industriales for 22 years. Sure enough, the ceremony did last just under three hours long. From speeches to live performances from famous singers right in the stands, it truly was like nothing I have ever seen. Everyone in the crowd was singing and dancing the entire time. The energy carried right into the game where the Industriales won 4-0. After every play, the crowd gave the players a response MLB players don’t get from their fans after winning the World Series. From blow horns to infinite waves, the crowd was proud to be at the game. 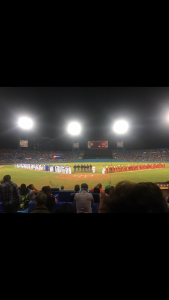 The MLB has something to learn from the party that is Cuban baseball, and the American people have much to learn about pride from the Cuban people.